The first time Antonio Magitt was arrested, he said, he was in eighth grade. The timid boy who liked to make people laugh had been quiet all day, feeling depressed, so he went to his school’s main office where his teachers had said he could find someone to talk to any time. “I wasn’t myself,” said Magitt, now 18. On the way to the office, he was stopped by a police officer who was monitoring the public school he was attending. Magitt said the officer, who thought he’d been skipping class, tried to talk to him. Magitt said that he was charged with aggravated battery and resisting arrest. He is only one of many African-American students in Chicago’s public schools who have been sent to court instead of the guidance counselor’s office when they misbehaved. According to Project NIA, an organization that promotes restorative justice, 3,521 students were arrested in Chicago public schools in 2014. Most of the charges were related to simple battery and other minor offenses. Of those who were arrested, 2,705 were African-American. For every white student arrested, 27.2 were African-American. After his arrest in eighth grade, Magitt was placed under supervision and transferred to an alternative school. But this did little to help him. “Why would [they] think that I’m roaming the halls or up to no good when I’m actually suffering from something?” This question often ran through Magitt’s mind. On some days, the questions he had about his experiences got so loud that he thought of taking his own life. It was a difficult time for him. For most of his childhood, Magitt had moved around the city living with his mother or grandmother. During eighth grade, he was packed into a one-bedroom apartment with four relatives. They struggled to pay rent and Magitt sometimes went to bed starving. The life that he was living made him angry, and he let out his anger by picking fights with other kids, a habit that led to many suspensions. He’s had different counselors since he was 13. Medicines didn’t work. He often found himself lying in bed, feeling like he was different from his classmates. The cycle continued until after he failed his sophomore year of high school. Dejected, he spent most of his summer sitting in his room as he reflected on his life. After a while, the silence gave way to some answers. He finally realized that nothing and no one could change him but himself. He was tired of being thought of as “this crazy, outrageous kid” who was always getting in trouble. “I wanted people to actually start looking at me like a human being,” said Magitt. Magitt started his junior year looking forward instead of looking back. His grades improved, and the teachers he used to dread became his allies, said Magitt. He was recruited as a mentor for freshmen students and joined Communities United, a grassroots organization that tries to address social inequality. 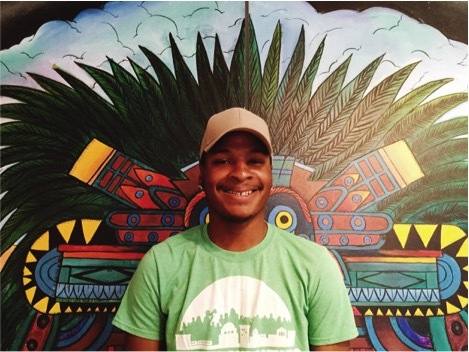 He’s been a youth leader at Communities United since October 2015 and recently started interning there. Magitt is not afraid to speak about the past. He carries his past with him wherever he goes, including community events, at work and at protests. But it no longer follows him like a shadow. Instead, it is a battle scar— a sign of courage for others to find hope in. Magitt shares his story because he wants to be understood. And he wants others to understand kids who are also experiencing tough times like him. He thinks troubled youth should be helped, instead of arrested. Many people, including officials, share similar beliefs. “We’re not doing a good enough job in the communities to help people who need mental health services versus being jailed,” said Cook County Commissioner Jesús Garcia, who spoke at one of Community United’s events. According to the Illinois Children’s Mental Health Task Force’s 2003 report, almost 70 percent of youth who are arrested and incarcerated in Illinois have mental health problems. “If they really get to know these students and learn from what they’re coming from, they will wonder why they’re doing things that they’re doing,” said Magitt, who has joined other students in the “Educate, Don’t Incarcerate Campaign.” He is one of youth who lobbies for the Eliminating the Unnecessary Arrest of K-12 Students Act. “I’m not saying what these students are doing is okay, but they’re doing it for a reason. And if you’re not trying to solve the problem or help them get through that stuff, they’re going to keep doing what they’re doing,” said Magitt. Now Magitt is an incoming senior at Roosevelt High, and he still battles with depression. But, as Johnson said, “He’s able to see more of a light at the end of the tunnel.” When Magitt finishes school, he hopes to become a social worker or a counselor. Patricia Nabong is a Masters student at Northwestern University’s Medill School of Journalism, with a specialization in social justice and investigative reporting. She is an associate member of the Photojournalists’ Center of the Philippines and the Tokwa Collective. Follow Patricia on Twitter @pat_nabong.